“Policymakers’ response to the crisis failed to address these issues; worse, it exacerbated some of them and created new ones – and not just in the US. The result has been increased indebtedness in many countries, as the collapse of GDP undermined government revenues. Moreover, underinvestment in both the public and private sector has created a generation of young people who have spent years idle and increasingly alienated at a point in their lives when they should have been honing their skills and increasing their productivity. My Comment: Our nature, egoism, is above our mind, and we are in its power. It forces us to act irrationally, even under the threat of our own death. As it is said: The angel of death brings a sword to a man and the sword has a drop of poison at the tip, and he is forced to open his mouth and swallow it, to fulfill his egoism, a sense of life, although this drop kills him. The elite cannot limit itself in exploiting society, even under the threat of unrest, wars, and self-destruction. Question: Now that the convention is over I feel that I am starting to go back to my previous state and I don’t want that at all. What should I do so that everything that I do and think about will be for the Creator in order to delight Him? Answer: The Creator has arranged our lives and nothing is up to us. It’s the same when it comes to politicians, economists, our relatives, and even us. The Creator intentionally arranges and organizes this life in the way we feel it so that from these specific conditions we will attain the revelation of His uniqueness, His wholeness. So the fact that you already feel that you are drawing away from the convention and returning to your previous life while still here with us is not a good sign. You should do everything in your power to warm yourself so as not to lose the level that you attained and to hold on to it by your teeth. I understand that it’s difficult and I even know that it’s impossible, but your slightest efforts to do so already help you ascend spiritually and it is net profit. Especially now when you are still here and your daily routine doesn’t pressure you, you should at least resist this in any possible way. I did similar exercises when I was with Rabash, when Iraq bombed Israel during the Gulf War and missiles fell about 500-700 meters from where we were studying. It was very unpleasant, but a person has to constantly try to hold on to the connection with the Creator both in the good states and in the bad ones. So try to constantly keep a small area in your mind in which you constantly keep in touch with the Creator no matter which state you are in, even if it’s a state where you feel nothing. Connection With God: Don’t Hang Up! Question: A convention is always a great test for us. How can we make sure that we are in the right direction between the conventions, even when we experience negative feelings? Answer: I cannot tell you when you experience negative feelings and when you don’t. If you are connected to us, you advance and the geographic distance is meaningless. I will say it again, you advance only when you are with us in all our collective actions because by missing a couple of lessons, you miss much more and then you will not understand what is said in the next lesson. You will not understand things internally! You will not have the necessary filling and satiation. My lessons are always inclined upwards, constantly upwards. You may think that it’s a repetition or that it has nothing to do with the previous material, but it’s not so! I always move forward! It may be presented differently, in a different manner or style, but it’s always on an increasingly higher level. So you mustn’t miss any lessons! If you haven’t had a chance to listen to the lessons for a couple of days for different reasons, then you should still watch them later. The problem is that many of our friends don’t take the daily participation in the lessons seriously while I base my study precisely on that. A student is a person who follows me step by step. There are no readymade forms and no idols in the spiritual world. A person forms spirituality by himself. The good and benevolent upper force that fills all of reality is infinite. It has one attribute and that is being the good and the benevolent, love and bestowal. But only a person who reveals this force can feel the good and the benevolent, the love and bestowal. So it’s impossible to speak about the Creator without a created being who reveals Him. Everything is clarified only with regard to the created being, only with regard to a person who attains spirituality. We always develop by two forces: the force of receiving and the force of bestowal. There is nothing but that in reality. There is only the desire of the upper to bestow unto us, which means to bring us all the goodness according to the goal and the definitions of the upper, according to which He has determined the creation, and also the force of the lower, which is a desire to receive. This force is in contrast to the upper force, but it is by the combination of these two opposing forces, for and against, that these two forces stabilize one another in the eyes of the one who receives. Therefore, our reality is divided into internality, which means to me, myself, and to externality, which means the world that surrounds me, the pulling force and the rejecting force, plus and minus, black and white. Every attribute has an opposite attribute and if we want to develop, we should establish these forms: both the “for” and the “against.” There is no Creator without a created being and there is no created being without the Creator. Only when they are two can they hold on to one another. So we have to establish our first form of development called Ubar (embryo) and also the womb where it can develop. This means that we have to establish both the form of the created being and of the Creator. These two forces, these two attributes, have to constantly be stabilized by us. We fulfill this mission in the group, just like a person with regard to the group, the individual with regard to the general, or an embryo with regard to the mother’s womb. The group has to stabilize itself as an embryo with regard to humanity, like internality with regard to externality. We work facing the simple Upper Light that fills all of reality, being good and benevolent to everyone without exception, to the evil and to the good. This is to say, it has no form or distinction. In the Upper Light there are no colors. And we want to stabilize ourselves like this Upper Light, only so our form will be based upon the desire to receive, meaning the opposite of the Light. But it must be similar in every manner of its external behavior. It follows that both the Kli and its fulfillment and the behavior of the Kli should all be situated within the desire to receive. This is our substance in which we situate everything. Even the Light of NRNHY that we discover symbolized in letters: The letter “Yod” is called Light of Hochma, the letter “Hey” is called Light of Bina because the form of bestowal from the side of the Kli is called Light. And that is how this is in everything, for the Light of Infinity itself is not felt, it disappears after the first restriction (Tzimtzum Aleph). We can attain the Light behind this curtain, after the first restriction, only by giving to our desires, to our Kli, created from our metal or material form similar to the Light that is found wherever it is behind the curtain. The desire of each one of us includes within it five levels: 0,1,2,3,4. And all the forms that we receive in our yearning to resemble the permanent Upper Light we determine through the changes that take place within our desire to receive. The Upper Light itself is permanent and simple, filling all of reality, and there is no change in it. It acts permanently as absolute love, a sea of Light. All changes are realized only within the Kli through the discovery of our Reshimot, through the communications between us. In each one of us, at every moment, new Reshimot are discovered, sometimes in one and sometimes in another, and all of our links with each change their form. And from this come all of the various forms of the Adam, the one similar to the Creator. If all of the many changes that take place within us are matched to the good and benevolent like the mother who asks her children to be good, then they give us understanding, feeling, and attainment of the Creator, which is born within us and doesn’t descend from some place above. This is a very important point because it directs us towards practical work in that it obliges us to relate correctly to everything that happens within us and in the connection between us. It is worthwhile to pay attention to all of this because specifically here we discover the Creator. And this symbolizes that the Creator is revealed between us. Baal HaSulam, “Introduction to The Book of Zohar,” Item 46: But the Kelim, called KHBTM in each of the lower worlds—Beria, Yetzira, Assiya—are not considered Godliness, but are rather covers that conceal the Light of Infinity within them and ration a certain amount of Light to the receivers. Each of them will receive only according to the level of its purity. It is as if I am next to some pipe that passes and receives the Light through it only according to the level of my purity, according to my equivalence of form. Suppose I am in the world of Assiya. On the whole, the whole ladder of the worlds is filled with the Light of Infinity, but every time the system stabilizes itself with regard to the one who receives and gives him Light according to the attribute of bestowal. 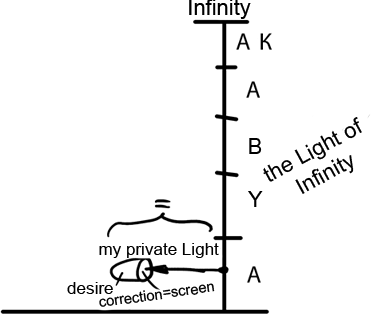 Thus, I receive my private Light that matches my desire and according to the level of my correction, my Masach (screen). I receive according to my equivalence of form with the Light. It is said about the annulment of one’s egoistic desires that no matter how much one cherishes them, one remains with absolutely nothing. It’s also about following Moses who acts solely for the sake of bestowal. The property named “Moses” raises us above our regular reality and teaches us how to change it because everything there has to work for the sake of spirituality, bestowal, and caring for others. We should devote our lives to others. We must constantly struggle and engage in self-analysis in order to find egoistic grains that have to be corrected. It’s immense and tireless work that grinds us like a mill, thus altering us. It’s extremely complicated to be constantly squeezed between heavy millstones that cut us alive; moreover, it’s us who should be spinning the millstones with our own hands and yet admire doing this work. However, these exertions are necessary to tune ourselves to bestowal and love. As soon as we manage to correctly self-adjust to bestowal and love, it turns out to be the uppermost pleasure, whereas when we deviate even a little bit, it turns into a terrible affliction. By detaching from ourselves, we begin sensing the upper state; if we fail, we immediately fall back to our egoism. By all means, having a clear indicator of a spiritual work is extremely beneficial, but it’s not an easy thing to achieve because our sensations, perception, and ability to analyze our past, present, and future levels are “glossed over.” We constantly live in a state of blurred vision: “Where are we? Are we in the property ‘for our own sake’ or in the state ‘for the sake of others’?” We continually make internal clarifications. Question: How can we constantly focus on love and bestowal? Answer: We can focus on love and bestowal only in the right environment, which is our salvation. 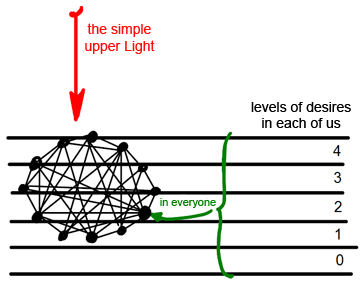 We cannot even imagine how effective and unique this help is, it is like a tuning fork in which we can tune every attribute, every string of the soul. On one hand, there are attributes of bestowal buried deep inside all the particles of the general soul thanks to the shattering. On the other hand, there are those who receive an awakening of this attribute of bestowal and are ready to start working with it and to connect to one another. The readiness to connect and unite turns their society into a spiritual mechanism in which anyone who wants to purify and strengthen himself in the right direction can do so. But this society has to constantly clarify and look for what else can be improved. This is what continuous group work is; everyone works on the connection with others. The whole egoistic collective is replaced by one unified society and then this one united attribute of love and bestowal, which everyone is dissolved into, a giant unit that is made of many, becomes a purifying force because the Upper Light goes through it. It resembles the Creator and is in equivalence of form with Him, with His force, with His unclear presence, and later with His clear presence that goes precisely through this system called a group. Now its representatives who are the carriers of the force of the whole group can go out to the public and work with everyone on connection.